Grew up eating this stuff. Custard buns. My cousin who now lives in Hong Kong sent me a recipe and I was able to make some... tears. This looks really lovely, but I'll be honest... I've never heard of a custard bun!!! Would you be willing to share the recipe? pretty fancy do buns Larry. If hey taste as good as they look - Yum! I would ike to see the recipe too and make some. I've never heard of them either. Basic sweet dough with custard filling. The spiral is the same as the filling, piped on top of egg wash just before baking. To make the filling, sift cake flour and corn starch and mix well with beaten egg. Heat milk, sugar and salt, stirring constantly. Add egg mixture and stir until thicken. Remove from heat, stir in butter and chill. Reserve 50g of custard filling for the spirals, and divide the rest into 12 portions. Wrap filling in dough (about 60g each), final rise for about 40 min or until doubled in size. Brush on egg wash, and pipe the spiral. Bake at 375F for about 10 to 12 min, or until golden. These are awesome.. I'm gonna make them for a Mothers Day treat. Question, you pipe the custard on before egg wash and before baking. Do you score the spiral or does the stuff just "stay on" the buns? These look just perfect! Brush the egg wash first, then pipe the custard on top. No need to score, it just stays on. They remind me of planets, shells and ancient spirals. And so yummy looking! Any tricks to filling the dough? Do we roll it out and flatten? Poke a hole inside a ball of dough and make a small cup to fill and pinch shut? Flatten the dough to a disk, place filling in the middle (shouldn't be runny) and fold the edges up and pinch shut. 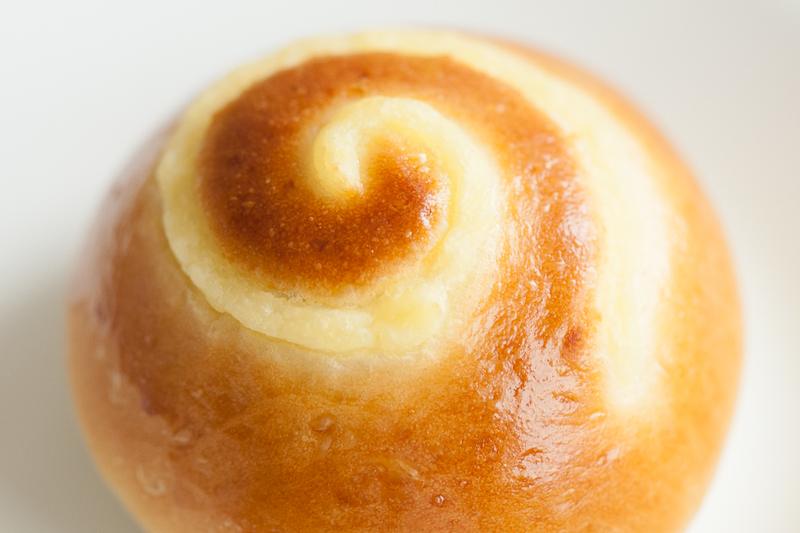 I have access to some very good custard buns, but I have yet to see something as pretty and delicious looking as these. 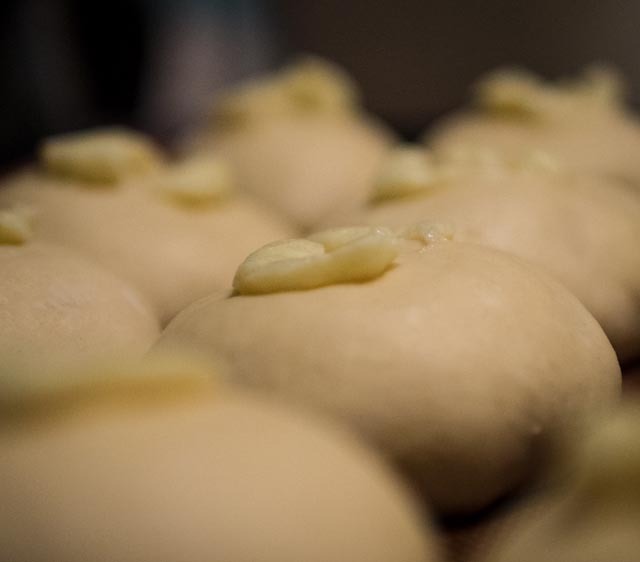 I learnt to make custard buns at the local bakers's union classes but I think they used instant custard at the time and it tasted very artificial. Your's should be delish! Couldn't resist! Buns rising as I write. I did find the custard lacked a bit of sweetness, so I added a bit of icing sugar and a drop of pure vanilla extract (homemade!) to it. Nice! Yep, adjust to taste :) Let me know how they turn out! Thanks for the recipee! Will definately make it again! I messed up on the spiral as my "pastry bag's opening" (a ziplock with cut corner) was too big, so I ended up with big blobs instead of nice spirals like yours. Although I just reallized as I am posting this, that I have forgotten the egg wash before baking... :-( No wonder yours looked so much nicer! But taste is great just the same! Now I must give them away before I eat them all! Sweet! I had the opposite problem--ziploc pastry bag opening was too small and had to snip more plastic. I'm having surgery next Friday and will be flat on my back for several weeks. Besides having goodies for my family who are coming to help me, I will need something special myself and these look incredible! In the highly unlikely event ANYone has ever NOT eaten all of them right away, can they be frozen? I've not tried it, but I think it should be ok. 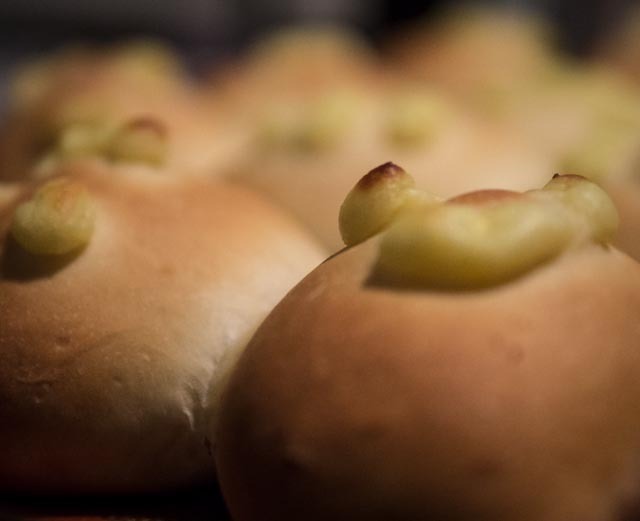 I realise this post was made a while ago, but I would love to make these custard buns. I made some just yesterday but I had such trouble filling them or , better, closing them up, the custard came out and they did not look as beautiful as yours. I did them from a video I found on youtube, the girl is chinese and OMG could she fill and close them well. I wonder if you could tell me a technique? Is the baking temperature for fan oven? Final question: did you use a Stand Mixer or knead by hand? I flatten the dough into a disc, and use a small cookie dough scoop to "fill" the custard, or basically place the scoop of custard in the center, then bring the edges in from four directions, and give it a nice pinch, maybe even a twist to ensure that it closes well. One thing I learned is that when you bring the edges together, make sure your hand is clean and free from any custard. Any fat would prevent the dough from sealing well. I made the dough in a bread machine using the Dough mode. The oven temperature is for conventional (non-fan) oven. Hope that helps! If they turn out well, don't forget to take photos! I shall give it a go again, I made some yesterday, photos in my blog, but they are by far not as good as yours. I followed a recipe that I found on youtube, a chinese girl made them. She used , for the swirls on the top, a paste made of water and plain flour. I shall give it a go again on Sunday since my family asked me to make more. I used my Stand Mixer to make the dough , I believe I might overworked the dough, so I shall be kneading hand this time. Nice Chinese style Dim Sum Custard Bao! no more Chinese deli for me Mahalo will try this soon. They look Ono! I think I will try with my Portuguese Massa Souped which serve double duty during the Holidays, so I can make Pāo Doce and Char Siu Bao too for the Holidays. Thanks will give em a go for Chinese New Year! Memories of afternoons with my gramma come flooding back. Do you make custard tartlets, too? these are beautiful. I am going to give them a try this weekend.